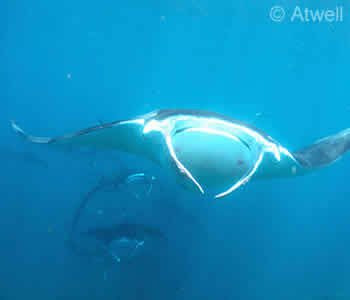 Manta Points I and II, located off Nusa Penida’s south west coast are great sites all year round for sightings of Manta rays. Although Manta rays can be seen year-round along most of Nusa Penida’s south west coast, there are two main ‘Manta Points’: Manta Point I (aka Old) and Manta Point II (aka New). Apologies for the lack of imagination in naming them! This area of coastline has dramatic limestone cliffs that descend straight into the ocean. On occasion the currents prevent even AMD-B’s powerful boats from reaching the divesite. In addition, although we do not encounter currents here, the swell can make entry impossible. There’s a sandy bottom at 12-18m, however the Cleaning Station (a large rock) which is the focus of most dives here, is only 5m below the surface. “I personally prefer ‘searching’ around the massive boulders that are found deeper at the site, however you’ve got a higher percentage chance of seeing Mantas if you go to the cleaning station”. Not quite as far from the other dive sites as Manta Point I, however if the Mantas aren’t here (unless other pelagics are around), there’s not much else to see other than sea, sand and your dive buddies. 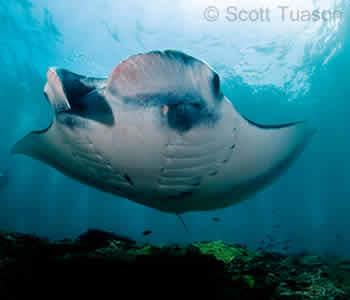 In AquaMarine’s experience, we see more Mantas here although they tend to be smaller. Because the site is shallow, with less surge, it’s often possible to snorkel here. At both sites you may also see other pelagics such as Nurse sharks, big tuna and Tiger mackerel. In sheltered areas you can see lionfish, octopus and cuttlefish; some big triggerfish including Clown triggerfish, and pufferfish. The water can be cold (22°C) because it comes directly in from the ocean but we often experience 28°C here as well.